I love redecorating with items I already have in the house. It feels like I have a brand new whatever whenever I find a new spot for any of my old house decor items. Last spring I decided to take the freebie mirror my sister gave me which was in the upstairs hall, and hang it above the buffet in the kitchen. While I do love the look I have to be very diligent about keeping the kitchen island clear, otherwise the mirror will reflect whatever is on the counter, and if it's a mess it feels like I have twice as much of a mess. So today when I took the fall wreath off of the front door to make way for the Halloween wreath, I got the idea of hanging it on the mirror in the kitchen...and I have to tell you that I love it! 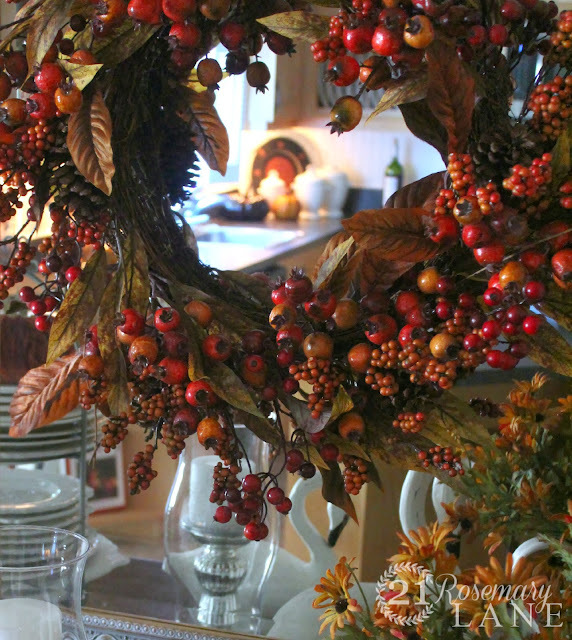 The wreath partially hides the image of the counter without totally losing all of its beautiful reflective quality, and gives me a great spot to display seasonal wreaths! This fabulous mercury glass and jute lamp I picked up at Home Goods last fall for about $35. A steal right? 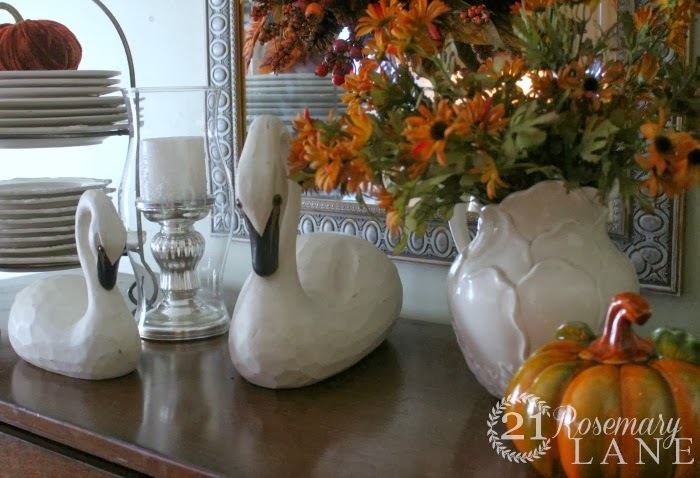 And those beautifully graceful thrift shop swans, which were part of my fall mantel display, made their way into the kitchen after I decorated the mantel for Halloween. 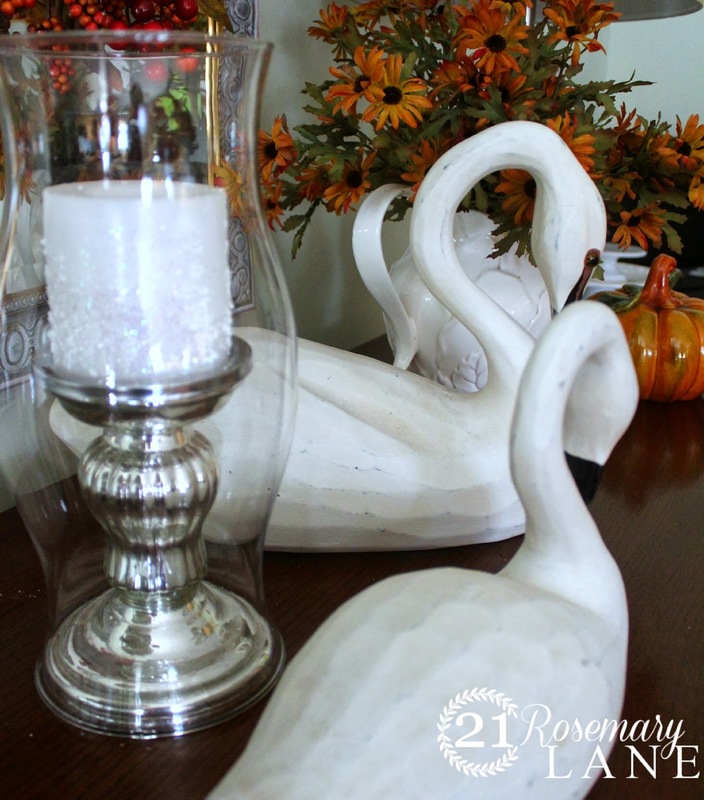 I added a little bling in the way of a single silver candle holder and by placing a hurricane glass around it. I adore my country white plates from both Phaltzgraff and the Christmas Tree Shop. 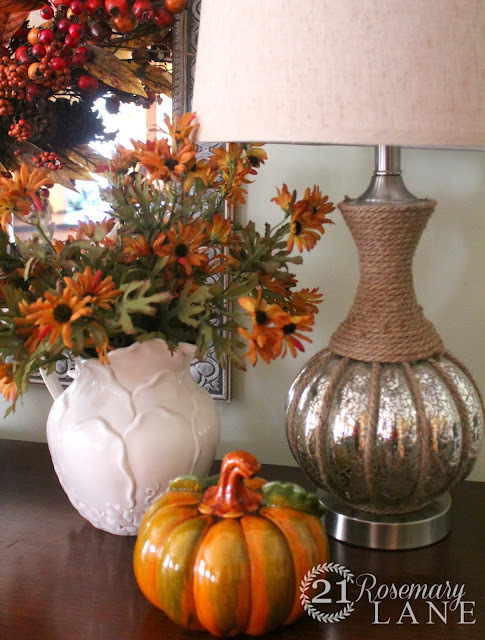 A couple of faux pumpkins in two different textures were added to the vignette and voila...it was done! I kept if very simple this year but did incorporate some pops of orange. Hope you are enjoying a relaxing weekend and wishing you an autumn bountiful with God's blessings. Update: Today I was moving more of my fall items around and decided to add the little rustic looking "FALL" banner I made to the vignette...what do you think? I love the buffet in your kitchen. It looks gorgeous and I love the idea of a mirror in the kitchen-even if it does mean you need keep things neater! The hurricane over the silver candle holder is striking. I too hung a wreath on my dining room mirror and I smile each time I pass by it. Your kitchen buffet is PERFECT! Your kitchen buffet is beautiful. I like the hurricane over the silver candle holder. Going to search for a small holder like yours to fit my hurricane. 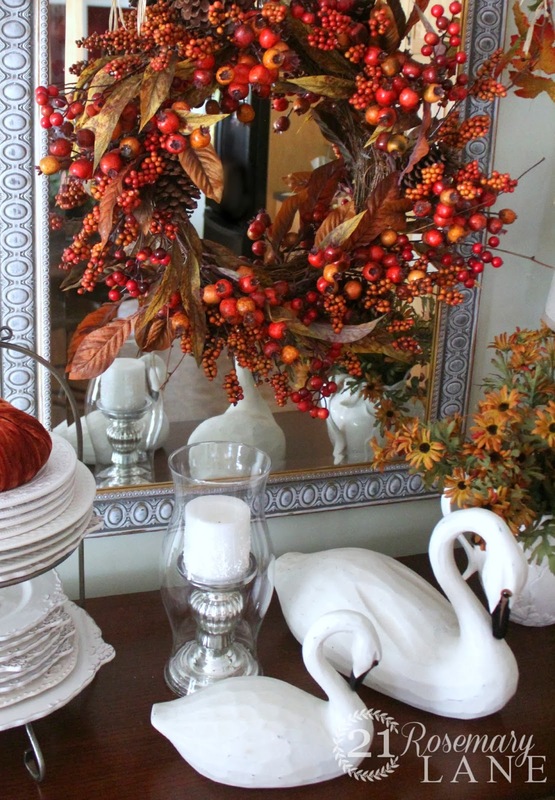 I hung a fall hydrangea wreath from a mirror in our dining room. A smile comes across my face each time I pass by. Your berry wreath is a bejeweled bracelet on that lovely mirror! Stunning! What a pretty seasonal vignette, soft and romantic and refreshing! Really beautiful. 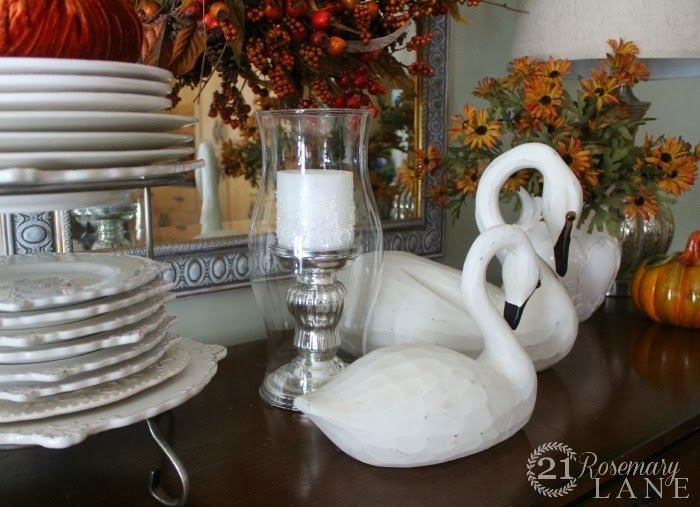 I love those swans. Beautiful Barbara...love that last shot!! It all looks great ~ I really love your wreath on the mirror! 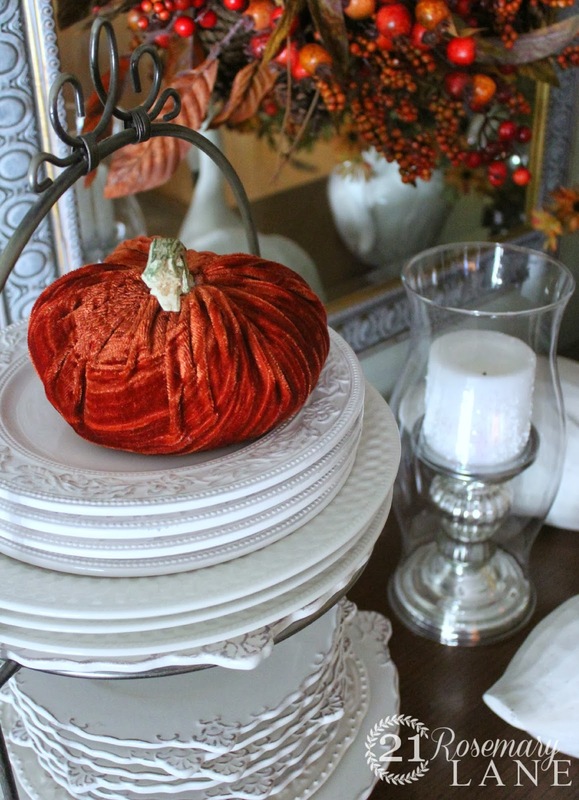 Your autumn touches are so pretty, love the wreath and the velvet pumpkin!! Absolutely beautiful! The swans are gorgeous...I just love them! They really make the vignette. Beautiful, love what your Fall décor....and you dishes are wonderful! 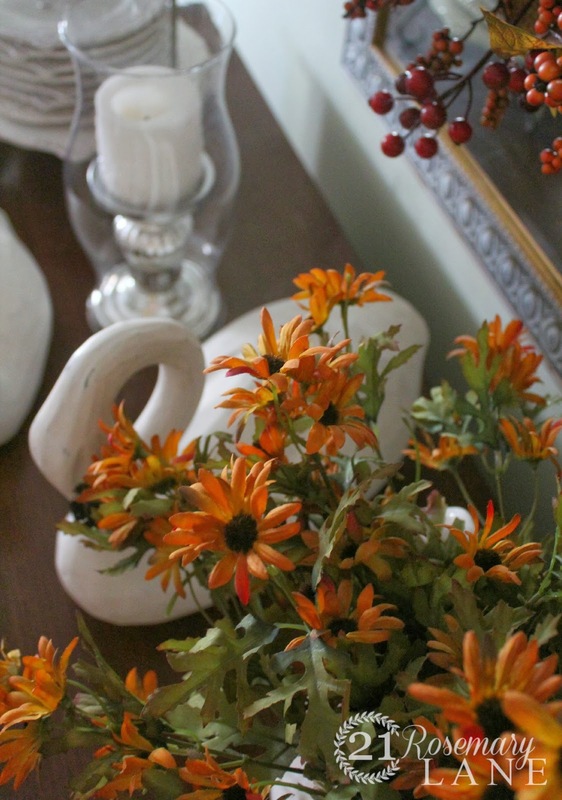 Love your Fall decor! Just the right amount!! Beautiful beautiful your space and so is your post! All those pictures are so gorgeous. I am deeply inspired by your creativity. 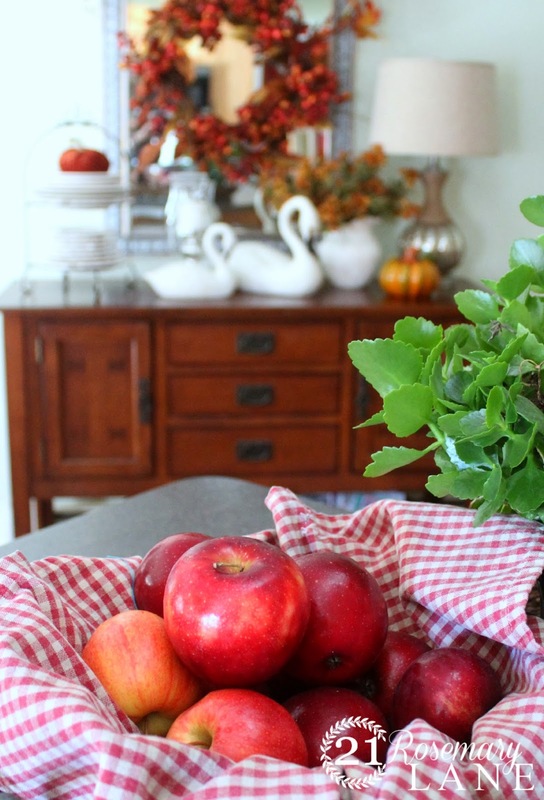 Your fall display is gorgeous! Your buffet is just gorgeous! Everything is beautiful, Barbara! 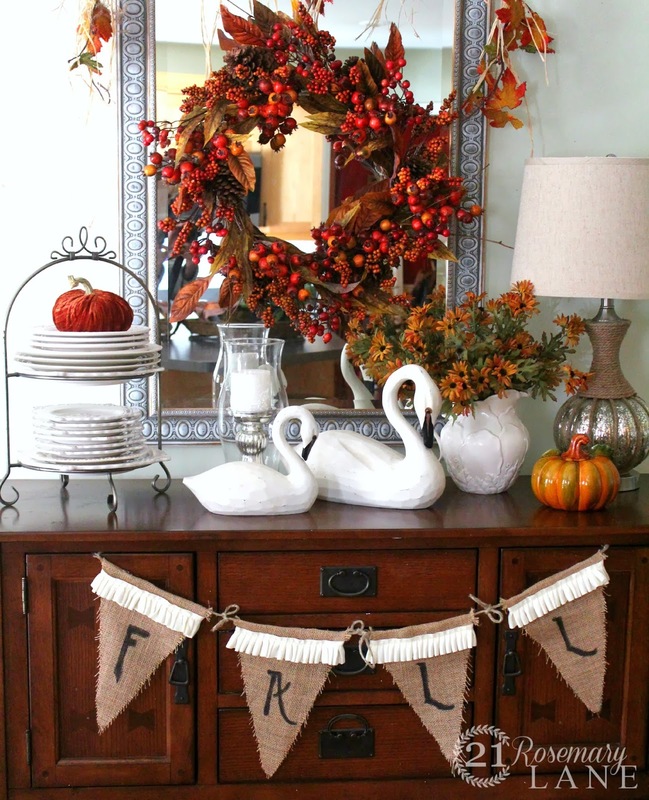 I love the cute banner and I appreciate you sharing your Fall décor at the Open House party. Barbara, I wanted to drop by to let you know to look for your feature this evening! 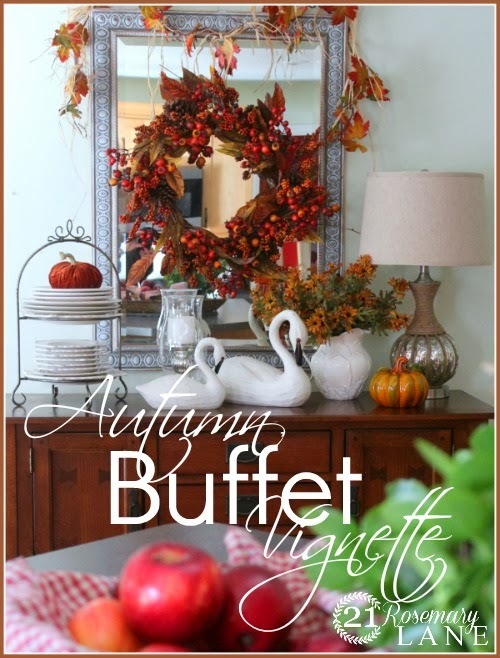 Your autumn buffet is lovely. 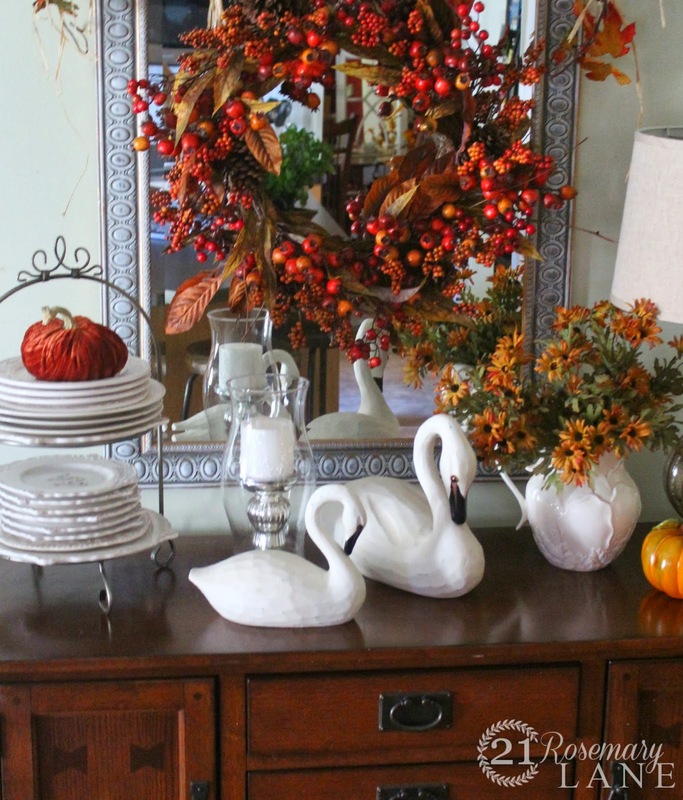 Love the contrasting colors of the wreath with the swans. Such a beautiful vignette, love the lamp too! New follower on GFC! 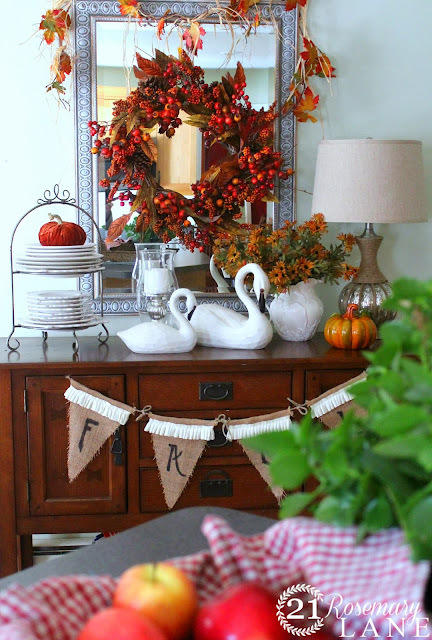 just beautiful, love the swans, and that wreath is gorgeous!! All the Way with Boothbay Gray!!! The Charming Homes of "Bewitched"